Psst… You’re viewing the No. 1 Google ranked Fieldhouse Kitchen recipe. Don’t forget to sign up for the newsletter, everydayFK, to join the party and get more great recipes. Ah summer in New England. So fleeting and short lived. These bay scallops, paired with a glass (or two) of Sauvignon Blanc, bring me back to summertime no matter the season. They’re light and flavorful. And when I cook them while listening to my favorite summer songs, well, I fall back in love all over again. Begin by washing your scallops with water and removing the small muscle that’s attached to the scallops. If you forget to remove these, you’ll end up with a rubbery bite. No fun. After the scallops are rinsed and the muscles removed, dry them thoroughly with a paper towel and season with salt and pepper. If you don’t dry them well enough, they’ll end up soggy and not crispy. After they’ve been seasoned, coat them lightly in flour. You can toss them in a Ziploc bag or pour flour on a plate and roll them around. Be sure to shake off the excess flour. In the meantime, preheat a pan over medium-high heat. Add enough olive oil to coat the bottom of the pan. Always preheat oil when searing and always be careful when cooking with hot oil. 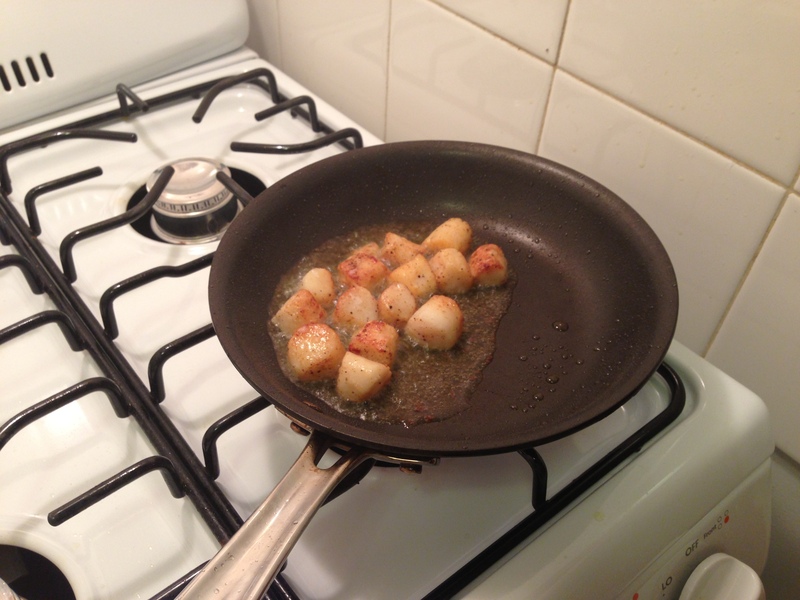 Make sure the oil is hot HOT before adding the scallops — you can test this by adding a tiny drop of water to the pan. If it spatters, then it’s ready to go! Be careful not to overcrowd the pan. If you overcrowd the pan, the temperature of the oil will drastically reduce and you won’t get that gorgeous sear. I work in batches because that small frying pan pictured above is the only one I have. I told you, limited supplies. After the scallops have seared and turned a golden brown (about 3-4 minutes), remove them from the heat and place them on a paper towel to absorb any excess oil. Plate them and drizzle them with the juice from half a lemon and about a teaspoon of chopped parsley for garnish. Don’t forget to pour the wine. Fieldhouse Fun Fact: The two bottles of Sauvignon Blanc that instantly bring me back to Maine summer nights: New Zealand’s Cloudy Bay and White Haven. What’s your favorite? 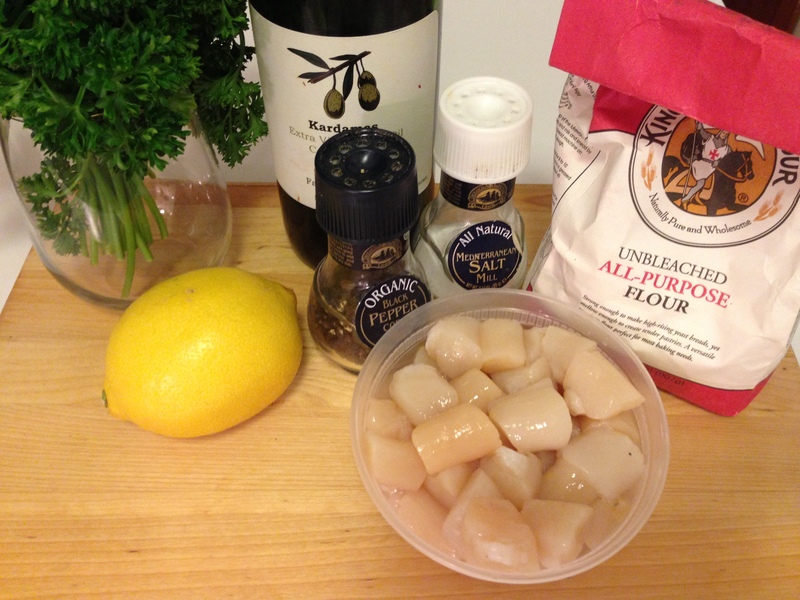 For years I’ve tried to find the perfect bay scallop recipe: now I have. Thanks for a great recipe and interesting read. I’m excited to uncover this great site. I need to to thank you for your time just for this fantastic read!! I definitely appreciated every part of it and i also have you book marked to check out new stuff in your blog.